For generations, Ballybur Castle near Cuffesgrange, was the principal seat of the Comerford family in Co Kilkenny. This castle, which stands to the east of the road between Kilkenny City and Callan, was lost by my branch of the Comerford family during the Cromwellian confiscations in the 17th century, and despite many efforts was never recovered by the family. Ballybur Castle passed to the Mansergh family, and later passed through the hands of other families, including the St George, Delhunty, Deignan and Murphy families, and it was bought from the Marnell family in 1970s by Frank and Aifric Grey. The Grey family have restored the castle with careful attention to detail, and I have been welcomed there on countless visits in recent years. Today Ballybur Castle is also a popular venue for wedding receptions. But recently I came across the story of a wedding connected with Ballybur Castle and the story of a young woman from Ballybur Castle who became a countess and the wife of a wealthy gold-mining magnate and philanthropist in Australia, Count Thomas James O’Loughlin (1866-1929). Thomas James O’Loughlin was born Thomas Laughlin in Castlewarren, a few miles on the Carlow side of Kilkenny City in 1866, and moved to Australia after inheriting the largest portion of the wealth of his uncle, Martin Loughlin (1833-1894). Martin Laughlin or O’Loughlin was born around 1833 into a farming family in Castlewarren, a small village bordering Saint John’s Parish, Kilkenny. In his teens, he was apprenticed to a biscuit-maker in Kilkenny, but he left Ireland to join the gold rush in Australia. When he arrived in Ballarat in Victoria, he made an early gold find. He invested in other mines and worked with varying fortune for about 10 years. He then stuck a thick seam of gold, and the resulting mine flourished. Martin O’Loughlin, as a major shareholder, prospered. He lived well, bought vast estates, speculated in land and hotels, and took up horse racing as a hobby. Even the 1890s depression left him relatively untroubled. All his ventures were successful, and he donated large sums of money to the church and to charity. When Martin Laughlin died in 1894, he left an estate of £250,000 ... the equivalent of about €21 million today. His nephews, Thomas and Martin Laughlin, were appointed his executors and the two brothers went to Australia four years later to administer their uncle’s vast estate. Under the terms of the will, a large sum was left to build a church in memory of the O’Loughlin family, in either Australia or Ireland. However, the parish priest of Castlewarren did not accept the offer of a new church and eventually fortune favoured the Kilkenny city parish of Saint John’s, where the O’Loughlin family had acquired a substantial property. The O’Loughlin Memorial Church of Saint John the Evangelist, built in the Gothic style, was completed in 1908 after nine years work at a cost of £40,000. The church was consecrated on 28 June 1908 and in the following month Pope Pius X made Thomas O’Loughlin a Knight of the Order of Saint Gregory the Great (KSG), so that he became known as the Chevalier O’Loughlin. Back in Australia, the Chevalier O’Loughlin met an Irish-born Loreto nun who was a daughter of James Murphy from Ballybur Castle. When O’Loughlin returned to Ireland, he visited Ballybur Castle and was introduced to the nun’s sister, and Kathleen Murphy, the fifth daughter of James Murphy of Ballybur Castle. The bride was attended by her sisters, Daisy and Sheela Murphy from Ballybur, and the best man was CP Close from Limerick. The wedding reception took place in the Club House Hotel, Kilkenny. 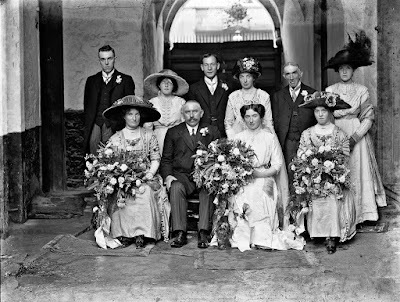 The wedding photograph was taken, probably in the Club House Hotel, by AH Poole of Waterford, who was commissioned from Ballybur Castle. In recognition of his generous benefactions to the Roman Catholic Church, said to have exceeded £100,000, Thomas O’Loughlin was made a Papal Count by Pope Pius X on his wedding day. The farmer’s son became Count O’Loughlin and his bride from Ballybur Castle became Countess O’Loughlin. The couple returned to Australia to live in Killarney Villa, Ballarat. They had seven children, but two of their children died within hours of being born. Later, the O’Loughlin’s lived at Tara Hall, in Studley Park Road, a neo-Elizabethan mansion, complete with turrets and gargoyles, spacious reception rooms and a splendid staircase. There they lived in state, with a manservant and a cook, several maids, and a governess for their daughters. Kathleen O’Loughlin died on 1 August 1925, following the birth of their first son, who also died at birth. She was just 44 years of age. The report of her death in the Melbourne Advocate on 6 August 1925 described her as ‘an exemplary Catholic mother and benefactress of the poor.’ Two bishops and about 40 priests took part in her funeral mass in the Church of the Sacred Heart, Kew. She was also survived by four sisters in the Irish province of the Loreto Order, three married sisters, and one married brother. After her death, a grieving Count O’Loughlin gave up Tara Hall and moved to a smaller house ay 38 Hawthorn Grove, Hawthorn. He died four years later in Brisbane on 21 June 1929. He was 63. On his death, Monsignor Lonergan said ‘there was scarcely a Catholic institution in Australia that was not in some way or other indebted to him.’ His funeral was held in Saint Patrick’s Cathedral. He left his five daughters, Kathleen, Margaret, Helen, Mary Agatha and Dorothy in the care of an aunt from Ireland; the eldest daughter was then only 17. Subsequent court proceedings delayed the administration of Count O’Loughlin’s will. It was not until 1936 that a Melbourne court ruled on the disputed will and a subsequent appeal to the Australian High Court found in favour of the count’s last will and testament. His bequests included a donation to Kathleen’s uncle, Canon Mackey, to erect altar rails and decorate the sanctuary of Saint Michael’s Church, Athy. Canon Mackey had in 1928, but the installation of the altar rails went ahead in 1937. Only one daughter is known to have married: in 1940, Mary Agatha O’Loughlin married John Berchmans Devine (1878-1955), a son of Sir High Berchmans Devine, surgeon, and they had three children. The O’Loughlin Memorial Church or the Church of Saint John the Evangelist is Count Thomas O’Loughlin’s legacy in Kilkenny. The O’Loughlin Memorial Church or the Church of Saint John the Evangelist is Count Thomas O’Loughlin’s legacy in Kilkenny. The church was built in 1897-1908, replacing an earlier parish church that stood in Maudlin Street and that took its name from Saint John’s, the former Augustinian Priory nearby on John Street, Kilkenny. The site, which was close to the earlier church in Maudlin Street was part of the Ormonde estate and it was presented free of all charges to the parish by the 3rd Marquis of Ormonde. Dorcas Birthistle has described the building of Saint John’s in the Old Kilkenny Review in 2001. William Hague was chosen as the architect of the new church, the contractor was Stephen Lalor, and the foundation stone was laid by Bishop Brownrigg on 2 May 1897. William Hague (1836-1899) was born in Cavan, the eldest son of William and Catherine Hague. He began his architectural practice at 175 Great Brunswick Street, Dublin, in 1861, specialising in church design and renovation. Hague was heavily influenced in his early work by JJ McCarthy, and by the gothic revival movement that was inspired by AWN Pugin, with its return to the styles of the later Middle Ages, especially the soaring spires of the cathedrals of continental Europe. Hague was involved in building Saint Augustine and Saint John, or John’s Lane Church, in Thomas Street, and he designed the soaring tower and spire at Saint Patrick’s College, Maynooth, where he also completed JJ McCarthy’s interior. In his design of Saint John’s, William Hague mixed conservatism with extravagance. However, his sudden death from pneumonia in 1899 and other problems left the contractor in serious financial difficulties. William Henry Byrne (1844-1917) of 20 Suffolk Street, Dublin, was appointed as the new architect, and Patrick Nolan from Monaghan became the new contractor. Thomas O’Loughlin, who was back in Ireland at the time, signed the contract for the completion of the church on 29 July 1901, and left again for Australia the following day. 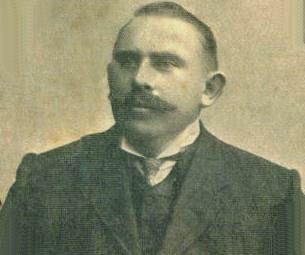 William Henry Byrne was born on 17 May 1844, the sixth child and third son of Peter Byrne of Peafield House, Blackrock, Co Dublin, and was a pupil of James Joseph McCarthy. He went blind about 1913 and died on 28 April 1917 at his home, Oakfield, Ailesbury Road, Dublin. Byrne is particularly associated with church architecture and was the architect for the Roman Catholic dioceses of Killala, Ossory, Tuam and Achonry and to the Sisters of Charity, who ran the Mater, Saint Vincent's and Temple Street hospitals in Dublin. He was also architect to the South City Markets Company Dublin, responsible for building the markets after the fire of 1893, and to Pim Brothers’ large drapery shop on the opposite side of South Great George’s Street. Saint John’s is built in the Gothic style. The plan consists of the nave, sanctuary with an apse, two side aisles and side chapels and an organ gallery at the entrance end. There are six bays of column-supported arcades separating the centre from the side aisles. The pinnacles, both outside and inside, the vaulted ceiling, and the decorative sculpture are notable features. The stone mullions and tracery of the windows have some echo of the original Saint John’s Priory. The church is built in a combination of rock-faced and ashlar-dressed Kilkenny limestone. The tower of the church, which stands at 74 ft, has an unusual flat tower. Flat towers can also be seen at St Edmundsbury Cathedral and other churches. A steeple of 234 ft was designed for Saint John’s but was never erected, possibly due to deterioration in the ground conditions and fears that the extra weight might threaten stability of the building. The church measures approximately 130 ft by 54 ft inside. Inside, there is a warm and joyful atmosphere, with a combination of columns, vaulted ceiling, timber, and decorative carving, and it is filled with colour and light. The vaulted groined plaster ceiling of the nave, sanctuary and side chapels are truly beautiful. The crossings of the ceiling ribs are decorated with carved bosses. The nave has five open bays. A sixth bay is occupied by the organ loft carried on an arcade with the porch situated underneath it. The nave is separated from the aisles by an arcade of pillars or clustered columns. The design of the sanctuary with a five-sided apse shows a continental influence as in England the straight end was more favoured. Each of the five-sided sections of the apse has a large single-light tracery window with hood moulding and bosses. The roof of the sanctuary is lower than the nave. The high altar was designed by the architect William Byrne. The central panel sculpted in Carrara marble depicts the Last Supper and on either side there are recessed panels containing Carrara marble angels in adoration. The tabernacle features double columns of Mexican onyx. The high altar and reredos were sculpted by George Smyth of 196 Great Brunswick Street, Dublin, was the sculptor of the high altar and the reredos. His other works include the pediment of Saint Mel’s Cathedral, Longford, and the transept altars in Cobh Cathedral. The pulpit is the work of Edmund Sharp, sculptor, of 42 Great Brunswick Street, who was also responsible for the baptismal font. The richly carved octagonal baptismal font, also by Sharp, is supported on columns of red Skyros and Siena marble. The splendid mosaic floor, which extends across the sanctuary area, is one of the most interesting decorative features of the church. It shows the influence of the Gaelic revival, with free-flowing, inter-lacing, animal heads and curves that incorporate different symbols, including the pelican feeding her young as a symbol of Christ, and symbolic representations of the four evangelists. The mosaic paving was part of William Hague’s design. The work was carried out under William H Byrne and Patrick Nolan to the design of Ludwig Oppenheimer. In the apse above the reredos, the three colourful stained glass windows were supplied by Mayer of Munich. The new church was consecrated by Bishop Brownrigg on 19 June 1908, and was opened on 28 June by Cardinal Logue. Thomas O’Loughlin occupied a special seat in the sanctuary. Before he returned to Australia, the Freedom of the City was conferred on him, and Pope Pius X made him a Knight of the Order St Gregory the Great (KSG). He was back in Kilkenny three years later when he married Kathleen Murphy from Ballybur Castle in Saint John’s Church, the church he had built, on 27 September 1911. Count O’Loughlin’s name is also remembered in the name of O’Loughlin Gaels, the GAA club in Saint John’s Parish. The club was founded in 1969, replacing the Saint John’s Hurling Club that began in 1887, and the club’s best known hurlers include the brothers Andy, Martin and Jimmy Comerford. O’Loughlin Gaels are one of the most successful Kilkenny clubs of the new millennium, winning county titles in 2001, 2003, 2010 and 2016. In 2003, they went on to claim their first Leinster senior title. In January 2011, they took their second Leinster title after a 0-14 to 1-8 win against Oulart-The-Ballagh. O'Loughlin Gaels meet Dublin’s Cuala in the Leinster SHC final on Sunday 4 December 2016 after beating Oulart-The Ballagh 3-17 to 0-17 at Wexford Park. When Rev. 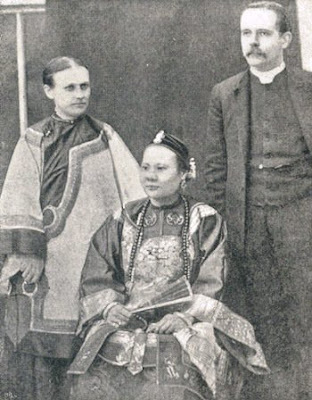 Robert Warren Stewart (1850-1895), his wife Louisa (Smyly), two of their children and seven other missionaries, were murdered in China in 1895, the massacre might have marked the end of Irish Anglican mission work in China. Instead, the story became an example of religious and missionary heroism and became an inspiration for many people who went from Ireland to China with Anglican mission agencies. Robert Warren Stewart was born into a privileged background in Dublin on 9 March 1850. His father, James Henry Stewart (1805-1889), a Dublin magistrate, was a nephew of the Duke of Wellington, while his grandfather, Henry Stewart (1749-1840), was twice MP for Longford in the Irish House of Commons before the Act of Union. Robert received an English public school education at Marlborough College, but returned to Ireland to study at Trinity College Dublin. Initially, he planned a legal career in London, but he experienced a spiritual crisis and a religious conversion in Richmond, Surrey, and at the age of 25 offered himself for service to the Church Missionary Society in 1875. He was ordained in Saint Paul’s Cathedral, London, on Trinity Sunday 1876, and shortly afterwards he married his childhood friend from Dublin, Louisa Katherine Smyly, a daughter of Ellen Smyly (1815-1901), founder of ‘Mrs Smyly’s Homes’. There was no time for a honeymoon, and Robert and Louisa left for China in September and on 14 November they arrived in Fuzhou in Fujian Province, halfway between Shanghai and Canton. Robert’s first years in China were spent in training Chinese teachers and catechists, while Louisa took charge of a school training Chinese women to teach from the Bible. However, their educational work was interrupted in 1878 with the renewal of a conflict known as the Wu-shih-shan Case, when the missionaries’ theological college was burned down and the mission was expelled from the city. In 1885, Robert was on leave and back home in Dublin when he was asked to address one of a series of meetings at the beginning of the new academic year in TCD. The organisers were inspired by the recent formation of university missions in Cambridge (1877) and Oxford (1880), and Robert Stewart was so inspiring a speaker that on one night forty young men came forward and offered themselves for missionary work. The meetings resulted in the foundation of two university-linked missions – the Dublin University Mission to Chota Nagpur and the Dublin University Fukien Mission, now the Dublin University Far East Mission. Back in China, Robert Stewart suffered severely from dysentery in China, and after another return visit to Dublin in 1891 he went on a fundraising tour to Australia, India and Canada before returning to China in full health in the autumn of 1893. Before returning to China, the Stewarts left their eldest child, Arthur Dudley Stewart, and two other children in the care of Robert’s father who was living in Kingstown (Dun Laoghaire). Back in China, the Stewarts began working in Gutian (Ku-Cheng) in north-east Fujian. But China was now at war with Japan, and the war stirred an open, armed revolt against the provincial government. Five-year-old Herbert Stewart, and his baby sister Hilda, were murdered along with their Dublin-born nurse Helena Yellop. Within minutes on that summer morning, Robert and Louisa Stewart, Hessie Newcombe from Ireland and five other women missionaries – three from Australia and two from England – had been murdered too. The other Stewart children survived miraculously. The Kucheng Massacre was one of the worst attacks on foreigners in China before the Boxer Rising in 1899-1901; the only comparable event in missionary history in China is the Tianjin Massacre of 1871. But instead of causing the surviving missionaries to take flight and flee, the murders fuelled a wave of enthusiasm that swept through the Church in Fujien, and saw a growth in support in Ireland for the work of the Dublin University Mission. Reverend Stratford Collins, who had arrived in China in 1888 as the first missionary from the Dublin University Mission, later recalled that shortly before his martyrdom Stewart had asked him: ‘Why does not someone found a society for the study of the thirteenth chapter of first Corinthians, and what good might be done!’ That chapter includes the words: ‘Love is patient; love is kind; love is not envious or arrogant or rude … It bears all things, believes all things, hopes all things, endures all things. Love never ends’ (I Cor 13: 4-8). Collins, who returned to China that year, asked some friends as he left Ireland: ‘Is it not better to be called away suddenly in the mission field than to die bit by but at home?’ Two years later, Collins was drowned in the River Min in 1897, and his distressed widow and two of their children drowned tragically at sea on the way home to Ireland. The Stewarts were the parents of eight children in all. Their eldest son, Arthur Dudley Stewart (1877-1948), had stayed at home with his grandfather in Dun Laoghaire. He too became a missionary in China, and worked in Hong Kong for 28 years, and for 21 years he was the principal of Saint Paul’s College. Between them, CMS and the Dublin University Mission supplied four bishops who served the Anglican Church in China: William Armstrong Russell, the first Bishop of North China; Herbert James Moloney, Bishop of Zhejiang (Chekiang), John Hind, Bishop of Fujian (Fukien), and John Curtis, Bishop of Zhejiang (Chekiang) and the last of the Irish Anglican bishops to work in China. Today, the Dublin University Far Eastern Mission continues to work on fostering and developing links between the Church in China, the Anglican Church in Hong Kong and the Church of Ireland. Patrick Comerford and Richard O’Leary, ‘Heroism and Zeal: Pioneers of the Irish Christian Missions to China’, China and the Irish, Jerusha McCormack, ed. (Dublin: New Island and RTÉ – Thomas Davis Kecture Series, 2009), pp 73-87. R.M. Gwynn, E.M. Norton and B.W. Simpson, TCD in China – a history of the Dublin University Fukien Mission 1885-1935 (Dublin: Church of Ireland Printing and Publishing, 1936). Jack Hodgins, Sister Island – A History of the Church Missionary Society in Ireland 1814-1944 (Dublin: CMS Ireland, 1994). ‘The Dublin Family Who Became Missionary Martyrs in China’ was first published in Salvador Ryan (ed), Treasures of Ireland, Vol III, To the Ends of the Earth (Dublin, Veritas, 2015), pp 142–145.